Egyptian cotton beach towel with Aztec sun design. Egyptian cotton beach towel with Aztec sun design. Manufactured for superior absorbancy and durability this towel will be a travel essential for summers to come. 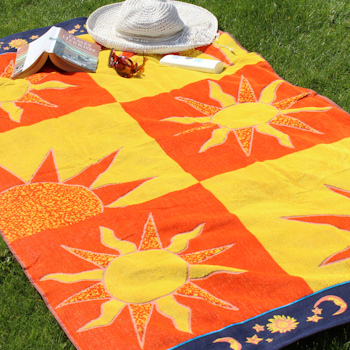 Jacquard woven cotton with a velour finish on the face of the towel with vibrant colourful sunshine design. Egyptian cotton beach towel with Aztec sun design. Manufactured for superior absorbancy and durability this towel will be a travel essential for summers to come. Jacquard woven cotton with a velour finish on the face of the towel with vibrant colourful sunshine design. Generous 90cm width and 170cm length, 450GSM sturdy weight fabric. Bespoke embroidery of personalised name, nickname or initials monogrammed on the bottom end of the towel in a complimenting thread colour and font style of your choice.